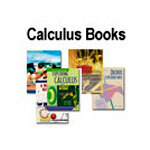 Workshop Calculus integrates a review of basic precalculus concepts with the study of concepts encountered in a traditional, first semester calculus course: functions, limits, derivatives, integrals, and an introduction to integration techniques. These titles are part of Springer-Verlags Textbooks in Mathematical Sciences series. Active Learning Prepares Students for Calculus Designed to develop students confidence and critical thinking, this text offers a fresh and effective bridge to calculus. CLICK ON PICTURE FOR FULL DETAILS AND PRICES.